Google Maps transit planner now reflects new schedule changes as long as you tell the system a date on or after September 4, 2010. 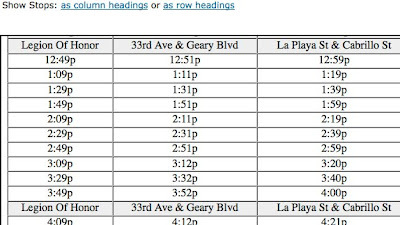 However, 511's trip planner program still reflects the old schedule when I asked it to show me the time schedule for the 18-46th Avenue for my regular commute. 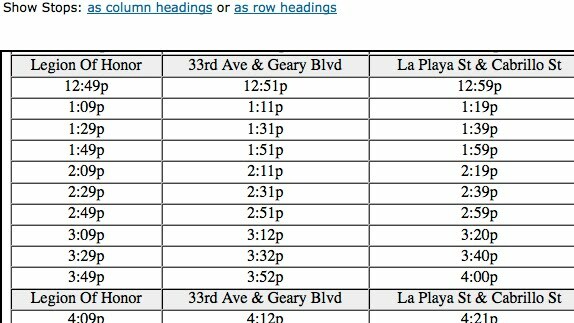 The above time schedule from 511 shows the 18-46th Avenue weekday midday buses will run every 20 minutes instead of the current 25 minutes. Whoo-hoo! But bad news for me, my bus will now arrive several minutes earlier. Rats. Prior to Dec, service was 1 40 ft coach every 11 min on both A and B segments of the line. After the two were combined. In Dec, service was 1 40ft coach every 9 min. The coach was standees only by the 5th stop from the terminus and skipping about 1/3 the stops. In May, they changed to 60 ft articulated coaches with the same frequency and all stops serviced. The Sept restoration changed it back to 40 ft coaches with the same 9 min intervals, skipping 1/3 the stops again.